Roanoke County's Explore Park is located at Milepost 115 on the Blue Ridge Parkway. The park's 1100 acres provide nature lovers the opportunity to enjoy nature’s beauty and wildlife while hiking, riding a mountain bike, or just strolling through the area. Explore over 14 miles of walking and mountain biking trails, all open to the public at no charge. 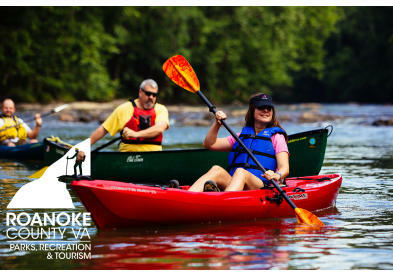 Fishing, canoeing and kayaking on the Roanoke River can be accessed at the Park’s Rutrough Point at the end of Rutrough Road, or along River Walk Trail. Take a hike through the park's historic area to see dozens of reconstructed buildings reflecting the history of southwest virginia from the 1800's through the early 20th century. Directions: Roanoke County's Explore Park is located at Milepost 115 on the Blue Ridge Parkway. Additional Information: Hours listed here are for Visitor Center seasonal operation (April - October). Park is open dawn to dusk.